Beautiful Flowers. Expert Advice. Personalized Service. My clients love Vermont and cannot wait to share that love with their friends and family for a destination wedding they’ll never forget. Nature and local surroundings influence their style, but it’s important to put a personal stamp on the day as well. The couples I work with are busy professionals, often working on a graduate degree or residency, and they’re looking for guidance on how to streamline the planning process. There is a desire to have a fun, relaxed, stress-free event. They want a joyful experience. They want to celebrate love. 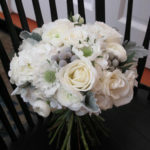 I help you express a personal story by using my experience to translate ideas into unique floral designs that are more than you could envision, yet truly represent your aesthetic. I’m all about the details. Planning a wedding can be a lot of work & I know your time is valuable. I make it easier. A successful wedding day means a “job well done” for me, but for you the wedding day is not an ending at all…it’s only the beginning. It’s an honor to be chosen to be a part of your wedding planning experience. I think you deserve the best. My clients are #1. Each couple is unique, as are their needs. I design my service experience around my clients because no two weddings are alike. I’m proud to provide expert advice & personalized service. I treat my customers with respect, honesty & transparency. I aim for prompt responses. My couples are important to me. It’s important that they know this from our first e-mail to our first proposal & all the way through the wedding day. Details create the experience. Weddings require precision & timeliness. There are no do-overs. Details matter. I do details. Floristry is tough on the environment. It’s my aim to be as eco-friendly as possible from the moment the flowers enter my studio to the time they arrive at an event. This entails sourcing eco-friendly product when possible, composting, reducing use of chemical solutions & a commitment to grow more of my own blooms each year. Every wedding booked provides at least 165 meals through the Vermont Foodbank. In 2016 Floral Artistry provided 5,400 meals to Vermonters in need. Click here to see this wedding at The Round Barn on Rustic Wedding Chic. I’ve been proudly featured in Vermont Vows Magazine. Amy & Matt’s Wedding at The Essex photographed by Birke Photography. Check out a rustic-elegant inspiration shoot with Orchard Cove Photography here. Read my bio here & learn more about Weddings!